The world has entered a new era of the nuclear arms race that is in some ways reminiscent of the Cold War.This is the central premise of a report published by British researchers from the BASIC group (British American Security Information Council). The world has entered a new era of the nuclear arms race that is in some ways reminiscent of the Cold War. This is the central premise of a report published by British researchers from the BASIC group (British American Security Information Council). “Whatever the current rhetoric about global nuclear disarmament from the nuclear armed states and others, in the absence of any further major disarmament or arms control breakthroughs, the evidence points to a new era of global nuclear force modernisation and growth”, the executive summary of the discussion paper said. According to BASIC’s analysis, the United States and Russia will remain at the forefront of the arms race, with a combined budget for nuclear improvements of $770 billion. The United States intends to spend $700 billion on nuclear weapons and related areas over the next decade and a further $92 billion over same period on nuclear warheads, and also plans twelve new nuclear powered ballistic missile submarines. Russia plans to spend at least $70 billion on improving its strategic nuclear triad by 2020, will introduce a new ICBM with multiple warheads and develop a new-generation SSBN to carry cruise missiles, as well as sea launched ballistic missiles. 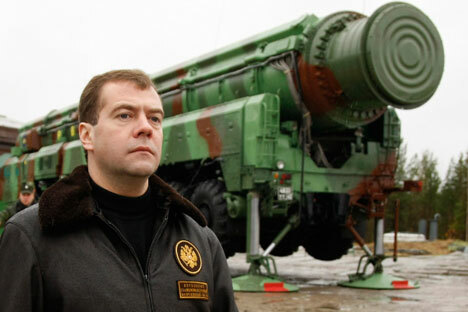 Moscow is also reportedly planning to deploy new nuclear-capable short-range missiles to ten army brigades. Extensive nuclear force modernisation or upgrade programmes are underway in all nuclear armed states. The discussion paper points out that Pakistan and India, for example, appear to be seeking smaller and lighter warheads for delivery over greater distances. In Israel, the size of the nuclear-tipped cruise-missile-enabled submarine fleet is being increased and the country seems to be on course, on the back of its satellite launch rocket programme, for future development of an inter-continental ballistic missile. China is rapidly building up its arsenal of mobile medium-range and long-range missiles with multiple warheads and has under construction up to five new SSBNs capable of launching ballistic missiles. France, too, has just completed deployment of four new SSBNs equipped with longer-range missiles with a new, more robust, type of warhead. Paris’s nuclear bomber fleet is also in the process of being modernised. BASIC believes that actual spending on nuclear stockpiles will eventually be significantly higher in all nuclear countries. For all the talk of the need to eliminate nuclear weapons from the world, all the nuclear states are modernising and upgrading their nuclear capabilities, the common justification being that their potential adversaries are doing the same. BASIC also warns that some states are starting to change their view of nuclear missiles, until recently considered to be primarily a strategic deterrent; these missiles are increasingly taken into account in non-strategic, tactical planning. For the record, the official members of the nuclear club are the United States, Russia, the UK, France, and China, in addition to the unofficial members -- India, Israel, Pakistan, and North Korea. Three countries – the United States, Russia, and China – have full-scale nuclear triads (land, sea and air delivery systems).